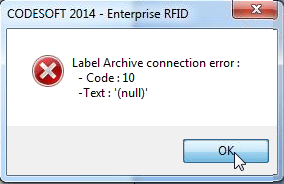 This Error Message Article explains the Label Archive error message “CODESOFT [Version – Edition] Label Archive connection error : Code : 10” and details how to fix the underlying problem that caused it to appear. CODESOFT client is unable to connect to LABEL ARCHIVE server. Customer was using a VPN connection with IPv6 got this message. The message disappeared when they tried to connect to the same LABEL ARCHIVE server from a PC on the LAN with IPv4. LABEL ARCHIVE Client on the client machine was not setup to connect to correct the LABEL ARCHIVE server. The server settings were set to ‘localhost’ but this was not the correct location. Opening LABEL ARCHIVE Client Administrator, entering the correct server name, connecting, and then saving the settings fixed the problem. In both the cases listed above, it appears that the LABEL ARCHIVE client plugin to CODESOFT was unable to reach the server. In the first case, a network setting seems to have blocked the connection. In the second, the setting itself was in error. We recommend first checking to make sure the LABEL ARCHIVE client settings are correct. 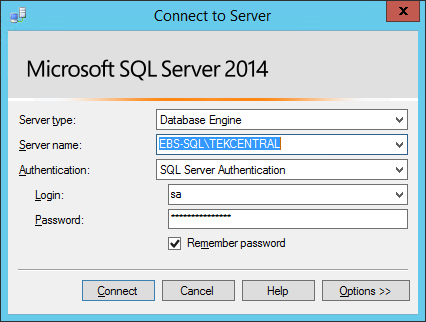 This can be verified by running a third party database application, such as SQL Management Studio, and using the same server name to connect to the SQL Server.